After what feels like months in development, CamerAlert v1.2 has finally been wrenched out of the dev teams bleeding hands and submitted to Apple for approval. This update adds a number of major changes and improvements but I won't spoil the anticipation by revealing all of them until we get the green light from Apple. I will however whet your appetite by saying that is is now fully iOS4 compatible and multi-tasking aware/capable. The success of this app has taken us all by surprise and we're committed to building on the feature list and improving it where we can. 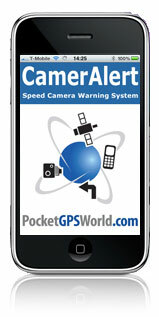 As it uses the very best data available it has a head start on all the rest and with the ever increasing user base of subscribers both via the CamerAlert app itself and our vast user-base on other GPS platforms we are better placed than ever to ensure that the data you rely on is the very best we can offer. As soon as we get the green light from Apple we'll post the full feature list and changelog. Great to hear you have a new version in the pipe line. I find the App a big improvement on the Tom Tom based option but get iritated when it closes for no apparent reason. That's lovely - you shouldn't happen to be working on an Android version? Good news Darren been waiting for this release. Do you have any feedback from Apple yet as to when we can expect it?? I've been eagerly awaiting this new release - is there any news on when it will be approved? I don't understand the approval process as I've twice known another app I use (Twittelator Pro) get same day approvals to fix problems caused by Twitter's servers. How come you are so low down the pecking order? it's with apple, awaiting review. what more else would you like to know?! I'm a little bit surprised at the delay, it does seem a long time since it was submitted for approval. But then Apple do seem to do things their own special way. I did wonder if it had been rejected as when iOS4 was previewed the Apps allowed to use true background multi-tasking seemed a bit restrictive in true Apple style and CameAlert may have fallen foul of those rules perhaps? I've just blogged about the delay for tomorrow's newsletter. Despite Apple having been very quick on the turn around for earlier submissions, something has clogged their systems this time. We've phoned them at great expense a number of times, emailed them daily, screamed, thrown tantrums and all to no avail. They tell us it's awaiting review/approval and we just have to wait, nowt else we can do. If anyone really thinks we have any clout with Apple and can make rush our app through Approval then we're flattered but we don't. We'e as desperate as you guys to see it out in the wild, we're delighted with it and want everyone else to be delighted too! I don't think even Stephen Fry has any influence over the App approval process. We will just have to wait patiently. That's always been my perception of the App approval process too, however recently Stone Design managed to get same day releases of Twittelator Pro twice within as many weeks. I wonder what influence they must have over someone in Apple??? ?